Consider that a win might valued around $8 million on the open market (that's a conservative estimate). Kimbrel would need to be worth about 11 for a team to feel justified in paying him $90 million over six seasons -- or less than two per pop. Is that a fair projection? It depends on how you evaluate him. Baseball Reference's Wins Above Replacement metric has him worth about seven wins the past three years. Sub in Win Probability Added and he's been worth nine wins in the same span. This certainly paints Kimbrel's unemployment in a different light, so far as teams are concerned. Remember that 23 clubs are at least $17 million away from the competitive balance tax threshold -- and that 22 of those have more than $24 million in breathing room. If Kimbrel really is seeking an average annual value around $14 million, then any number of teams with shaky bullpens could sign him without compromising their ability to make deadline deals. 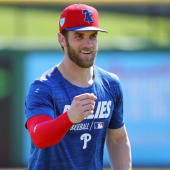 That group includes the Philadelphia Phillies (21st in bullpen ERA), Seattle Mariners (20th), Atlanta Braves (18th), Minnesota Twins (17th), Milwaukee Brewers (16th) and so on. Those are just the contenders who have serious breathing room. The Washington Nationals rank 30th in bullpen ERA and would be $5 million over the tax threshold if they gave Kimbrel $14 million. Note that the Boston Red Sox, who possessed the league's biggest payroll last year, paid less than $12 million in penalties despite being a repeat offender more than $40 million over the threshold. The penalties, then, are hardly a non-starter. It comes down to teams' desire to win: If it's high enough, they'll pay; if not, they'll use it as a flimsy excuse to not make the effort. For the sake of Kimbrel and fans who enjoy watching him pitch, here's hoping some team steps up to the plate in the coming days and signs the pitcher who has the all-time most saves through an age-30 season.